A gas pipeline to Malta from Sicily will cost €320 million and could be completed in seven years, Prime Minister Joseph Muscat said at a signing ceremony with the Sicilian regional authorities for better cooperation. Dr Muscat did not say when the project was expected to be completed since permit applications still had to filed with the respective planning authorities in Malta and Sicily. The ceremony held at Auberge de Castille was also addressed by Minister Within the Office of the Prime Minister Konrad Mizzi, who said planning permits would be filed over the summer, kick-starting the environmental impact studies. The agreement was intended to foster better cooperation between the Maltese government and the Sicilian regional authorities to ensure faster permitting and implementation. The gas pipeline project was approved by the European Commission as a project of common interest, which means member states have to ensure swifter and more efficient processing in planning applications. Dr Muscat said the project was feasible and it would be done within the stipulated timeframe and on budget. It would be part-financed by the EU and once the gas pipeline was in place, the liquefied natural gas tanker moored inside Marsaxlokk Bay would sail away. The agreement was intended to foster better cooperation between the Maltese government and the Sicilian regional authorities to ensure faster permitting and implementation. Dr Mizzi said the pipeline would leave Gela on Sicily’s southern shores and land at the northern face of Delimara, where it would cross the peninsula underground and reach the power station. He said the pipeline would be able to carry more gas than the power stations required since the fuel could be put to other uses. He said a company would be set up over the summer months to take ownership of the project and the pipeline. 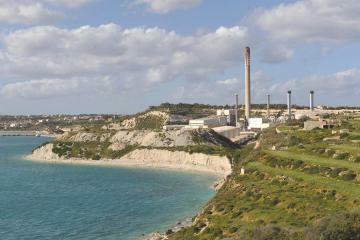 The company would be a subsidiary of Petromal, a government company, which would sell the gas to Enemalta.